Partnerships: Jyväskylä teachers training school, local artist Martti Kapanen with the fund of National Council of Architecture. Goals/Aims: To get student being aware of their built surrounding, to observe and to be critical. Methodology: To wake up the interest by giving background knowledge of the larger project called Everyday environment and to shake the normal way of seeing and thinking. Photographing was chosen as a tool. By having a discussion what each people think is beautiful and what is ugly and why - in their everyday hanging areas. To show a different ways of thinking we invited a local photography artist Martti Kapanen to tell and show his works. The students were photographing the city and combining they photos either as posters using a collage or binding them as books and commenting what was nice detail in a city and what was not. Outcomes: The students were quite amazed about what kind of details they found from the city what they normally didn't observe. 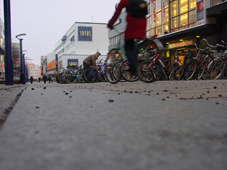 They became aware that urban areas are combinations of many small things not only buildings and streets. In the beginning of school year 2005 groups of architecture of Pori Art School for Children and Youth took part to the children’s culture week in their hometown Pori. 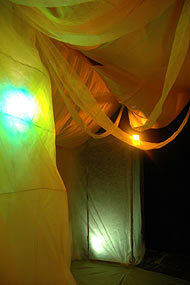 The purpose was to build a huge installation/ scenery for ceremony in a local Youth Culture House. The participants were secondary grammar school students aged 13-14 years. The others had studied architecture one year, and for the others the project was first one. The interest in the project was space in reality: how does it feel and how is it possible to create the sense of space with forms, lights and even sounds – encourage the young people to see themselves as agents of change. It was possible to take a room we wanted for to do anything. The timetable was tight - three times (each 2,25 hour) to build scale models in groups and to do finally decision-making between 15 persons. The conclusion was to do the labyrinth with three different kinds of spaces which could offer surprises. Also this could help working to dividing students into three parts. We had 7,5 hour to realize the plans. Beforehand the walls were painted according to plan. The other materials used in project were mainly recycled. We got a lot of help with the structures from employed boys in Culture House and also from retired lighting-master for lights. The labyrinth was one of the attractions for kids in the gala ceremony. In the third floor of Culture House kids found our space installation. The first “oriental” and sunny space welcomes with belly dance music. Walking forward you got to the sewer: the dark place with junk, knocking music and black light (get your teeth and eyeball to shine). The third and latest space was the Heaven with white and softly walls and ground and lovely music. The project was productive for all participants. For youth the best of all was building - there wasn’t so much limits. The role of teacher was to inspire and encourage the youth realize possibilities which their couldn’t see. The result was successful. 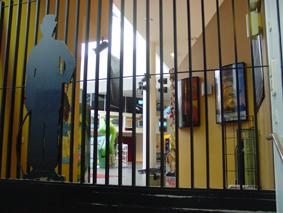 The young set designers were happy about what did they succeed to do. Also there were a lot of interested users: during the day of ceremony approximately three hundred kids walk through the labyrinth about 3-4 times. Participants and facilitators 15 young people from across Helsinki aged 10-14 years. Students worked with two architect students as facilitators. 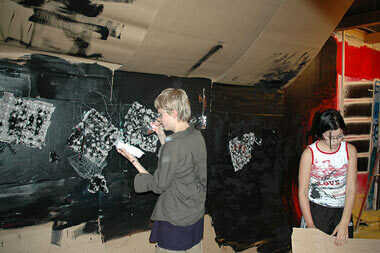 Goals/Aims: Children and young people participationg in architecture and design of their environment. Methodology and means Students participated in a wide range of activities including following the whole design process of a building, participating in interior design, visiting the construction site and all main events through the building process. The architecture & design workshop included a variety of drawing and painting tasks, games and excursions, each intended to further the design process towards the real project. Save The Children is an organization that fights for the rights of children to make their life better all over the world. 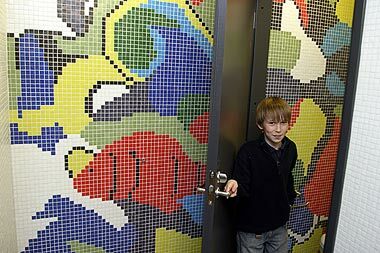 When Save The Children constructed their new headquarters in Käpylä, Helsinki, they wanted children to participate in the design process of the building, since it was to be a building for children. The house is called Tiukula and it houses their central office and Southern Finland office. A team was set up to plan the participation process before the designing of the project started in fall 2002. In March 2003 architect of the building Hannu Jaakkola represented the Tiukula–project in Arkki, school of architecture for youth and children. A group of Arkki´s young students had this exceptional chance to take part in this design project. These young people interested in architecture were very excited about the project and spent the rest of the spring thinking and sketching ideas for the art mosaiques on the floor and walls and art-surfaces on the office-walls. Sea world and underwater life was chosen by the participants to be the leading theme in young artists design. Fall 2003 the design-group started to examine the underwater life and draw visions of sea world and its life and animals. 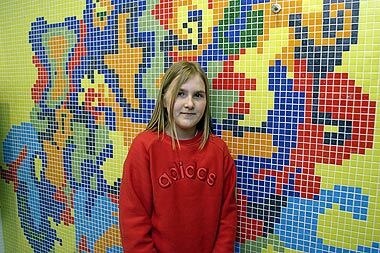 The youth took part in three design projects; the art-mosaique of the main hall floor, the art-mosaiques of the common sanitary space walls and the art-printings on office walls - all of them under the sea world theme. For inspiration the design group made an excursion to Sea World in Helsinki. They wanted to see how the world really looks like under water. In Sea World the children sketched sea-animals and vegetation in their sketchbooks. They were really excited about the multiplicity and richness of underwater world and this experience provoked many good ideas and artwork. Later in the process, they examined the animals and plants more precisely for one year leading to the excellent and versatile final outcome. 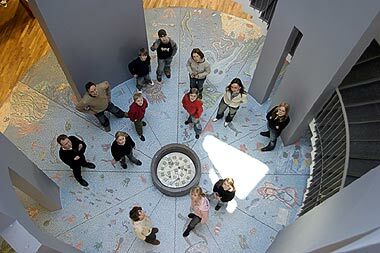 During this year2003-2004, the big art-mosaique on the Tiukula main floor, ”Secret of Neptune”, was designed. The group designed also various ornaments under the main sea-theme. Some of them were chosen to be built as mosaiques on the sanitary walls. Some of them were also chosen to be printed on the office walls. Some of the precise examinations of sea nature and – animals were also chosen to be office-wall printings. Along the way there were many memorable events connected to the emerging building. The young designers participated in laying the foundation stone together with Finnish President Tarja Halonen´s husband 9.5.2004, the roofing celebration 30.9.2004 and the grand opening party 3.5.2005 accompanied by the president. The young designers were very impressed of the artworks they made. ”Secret of Neptune” on the main floor, the mosaiques on the common sanitary walls and the art-prints on the office walls made them very contented. They thought that it was a very succesfull series of underwater art. The children were wondering whether the big floormosaique or its piecework was bigger. They were impressed of the huge size of the artwork. ”Oh, is it so enormous?”, asked one of the young artists by the ”Secret of Neptune”. ”Yes, it is a peek to the deepest sea”, answered one of the young collagues around. The members of the design team from Arkki were Vanilla Aminoff, Nea Hukka, Annika Jaakkola, Volodya Mykhalevykh, Emilia Nordgren, Noora Nuotio, Janina Raikkala, Jasmin Skinnari, Juho Tuomainen, Laura Tähtinen, Tarmo Vento, Janis Wichmann, Martin Wichmann and Xin Yli-Rekola. They were led by architecture students Anna Bevz and Sini Karelia Meskanen The whole design process was made in associoation with the architects of Tiukula- building. Students increased their awareness of the building process, gaining insight into the design process and working in a team through direct experience. Tiukula is an examplary building venture, where the children`s participation has been taken to the end on such a demanding level. The architects of the building, Vesa-Jukka Vuorela and Hannu Jaakkola from Architects Hannu Jaakkola, have expertly succeeded in interlinking the artwork of children with the architecture of the building.